While Prime Minister Ehud Olmert called for the unity of the citizens of Israel and their support for the operation in Gaza, hundreds of left-wing activists gathered on the Defense Ministry's lawn to protest the deaths of over 200 Palestinians. Five of the protestors were arrested for rioting after they damaged the security fence and clashed with police forces on the scene. Around 300 activists took part in the protest, in order to condemn what they called Israel's "genocide and war crimes". 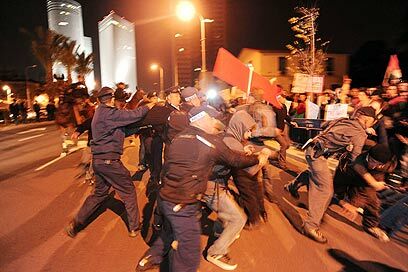 The demonstrators marched through the streets of Tel Aviv until they reached the ministry's headquarters. Many cried slogans such as "No to war – yes to peace", and carried signs saying "Israel's government is committing war crimes", "Negotiation instead of slaughter", and "Lift the siege from Gaza". During his speech the prime minister noted that Israel did everything in order to enable the lull in the south to go on. See all talkbacks "Left-wing activists protest Gaza op as 'genocide'"